Is it smarter to send your knives to get sharpened, or to do it yourself like this? If I want to sharpen my own knives, are the listed items a good starting place? My answer is that there isn't one simple answer, it depends on who you are and what you want to use your knives for. Me, I'm a slightly disorganized amateur. I use my knives, on average 15 minutes every day, the day before Christmas perhaps 2 hours and on some days only five minutes. For that reason I don't spend a fortune on knives, instead, I buy middle of the range stuff, based on how they feel in my hand, the stiffness of the blade, etc. Since I'm slightly disorganized, sharpening of my knives happens on a whim - no, this is too dull, I have to do something NOW - for that reason I sharpen my knives at home, sending out takes way more planning than I'm capable of. Since I haven't spent a fortune on my knives, I don't mind using one of those mini grinders on my knives, they are fast, efficient and gets the job done. The steel I use for everyday use is my only regret. I should have gone for something longer/bigger. A good quality 12 or 14-inch steel is definitely on my wish list. First of all, rough grain is used to repair knives when they have chipping. It grinds the blades efficiently. From #100 to #500 are available in general but from #200 to #400 are suitable for knives. Middle grain is used for edging. At your home, this will do everything for you and good enough to have this kind only. From #800 to #1200 are suitable. Finishing grain is used for getting rid of tiny scratches that are made by middle grain and doing “Kobadome” that is a method to make edge stronger. From #3000 to #10000 are available in general but #4000 is often used. If you would like to this kind of finishing grind as your next step, this is what we recommend. Bear in mind that the English version of the Tojiro website appears to be largely unfinished/broken. If you only have the one (or few) good knives, then a couple of stones seems to be the economical solution. I have a set of 5 or 6 "good" knives, so I spent out on an electric sharpener which works well for me (I get them all done within the space of a few minutes without fretting about getting the right grain size, the right angle on the stone, etc.). The DP is on the harder side, and is "too japanese" in blade design to trust old school professional sharpeners with unless they know japanese knives. A sharpening steel, especially if used without much practice and knowledge, is likely to do more harm than good on these (or anything specified at 60+ HRC). A flat leather or wood strop (no need to load it with abrasive pastes) is often the best touchup tool for that kind of knife. Th King stone is very good, but requires soaking, very frequent flattening and tends to make a mess - it is great for the workbench, not good for in kitchen use. Get a decent coarse stone instead of a flattening plate, you'll need it sooner or later anyway. Bamboo cutting boards aren't the gentlest on the knives, but have less warping problems than true wood boards and are OK to use. Not the answer you're looking for? Browse other questions tagged knives cutting sharpening or ask your own question. 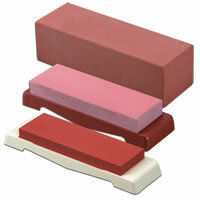 What type of whetstones are you using for sharpening stainless steel knives?